The advantages of decorating a fish tank with live plants instead of plastics are numerous.A healthy planted aquarium is essential to maintaining a healthy fish population. Most importantly, plants contribute to balancing the oxygen level and algae growth while providing hiding places for fish. However, it is hard to cultivate plants in an aquarium because it requires some effort. Plants need lighting, water circulation, and good aquarium substrate to grow healthy. Substrate is the medium where plants and beneficial bacteria grow due to the rich nutrients. Each plant requires different care and each substrate type depends on the plant species in the tank. Gravel is one of the most common substrates for freshwater aquariums. This substrate is cheap and easy to use in the tank. Plain and uncoated gravel between one to three millimeters in size is suitable. Gravel size should not exceed 5 millimeters. Gravel should be free from any kind of chemicals because they can be toxic for the fish. 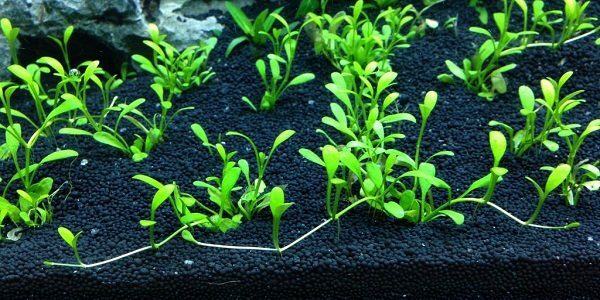 Your aquarium surface should be covered with peat moss or laterite layer and the gravel should be placed on top of this layer; these under layers provide the necessary nutrients for your plants. The gravel should cover the roots of the plants. Nevertheless, the cheapest gravel will not contribute to plant growth; plants need iron (Fe) to grow. A high-quality substrate will provide the proper iron needed for the plants. Therefore, a combination of gravel and commercially ready (eco-complete) substrate is a good choice for plant growth in the aquarium. Sand is one of the most common substrate materials for plants because it gives the aquarium a natural look. Silica sand, onyx sand, pool sand, and other commercial types of sands are available for an aquarium environment; however, these substrates do not contain adequate nutrition since sand compacts too tightly with the plant’s roots and can obstruct oxygen and nutrient intake by plants. Fortified sand can be purchased and commercially sand is available, such as Fluorite, to be used together with common sand in the planted tank. One important detail to remember is sand can be dusty, so before using any type of sand, especially silica sand,wash it to remove any dirt. Vermiculate is rich in minerals such as aluminum, magnesium, and iron. It has a compact structure, thus is recommended to mix with gravel or laterite. Usually vermiculate is used as a lower layer in a planted aquarium. Laterite is clay with a porous structure rich in iron. The substrate can be used both as a lower and upper layer. It is necessary to be washed before using as an upper layer. Fluorite has an extensive usage in planted aquariums, yet is not suitable for delicate roots. The substrate is porous clay gravel, light and loose,which differs from common gravel. Although Fluorite is more expensive than gravel and sand, the substrate contains high amounts of iron. It is possible to use Fluorite for a long time without needing to change it. A mixture of gravel, sand, and fluorite substrates can be used in a planted aquarium though it is recommended to rinse fluorite substrate before using. Eco-Complete contains high amounts of iron and all the necessary nutrients (more than 25) for plant growth. This substrate contains heterotrophic bacteria that contribute to plant growth. The bacteria in the substrate can convert the waste in the water to a useful material, making it useful for many types of plants.The substrate can be used directly without washing and does not need a lower layer for fertilizing the plants, as it can handle this function on its own. Regular care of the substrate is very important. Vacuuming the substrate once a week is recommended and sand should be raked to prevent waste collecting. This simple application will prolong the duration of the substrate usage. Mulm (detritus) accumulation is also recommended on the base of the substrate as a fertilizer for rooted plants;however, the nutrient deficiency should be followed.